carried the news, the weather, maps, emergency contacts. bar over a brown derby. Sometimes we carried her black eye. theirs. We carried fear each time we left. We carried our luckiness. of each other’s mouths. Sometimes the carrying was so gentle. Stevie Edwards is the founder and editor-in-chief of Muzzle Magazine and senior editor in book development at YesYes Books. Her first book, Good Grief (Write Bloody, 2012), received the Independent Publisher Book Awards Bronze in Poetry and the Devil’s Kitchen Reading Award from Southern Illinois University, Carbondale. Her second book, Humanly, was released in 2015 by Small Doggies Press. She has an M.F.A. in poetry from Cornell University and is a Ph.D. candidate in creative writing at University of North Texas. 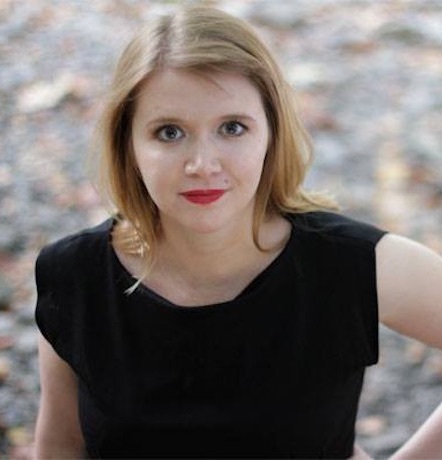 Her writing is published and forthcoming in Indiana Review, The Offing, Ploughshares Blog, Nano Fiction, Redivider, Yemassee Journal, Baltimore Review, The Journal, Rattle, Verse Daily, Nashville Review, and elsewhere.